Hideo Kojima is a world-renowned game creator and auteur known for pushing the boundaries of the video game medium. Widely considered the father of the stealth genre, he is also credited with innovating story-telling and cinematic presentation in video games at large. His works include the best-selling METAL GEAR series, as well as a diverse range of projects such as Snatcher, Zone of the Enders, and the legendary horror playable teaser P.T.. Most recently, Kojima was responsible for the direction, script writing, game design, and production of the latest critically-acclaimed chapter in the METAL GEAR series, METAL GEAR SOLID V: THE PHANTOM PAIN. Known for his unparalleled love for movies, he is close friends with J.J. Abrams, Park Chan-wook, and Guillermo del Toro, among other film directors. 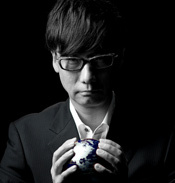 In 2001, Hideo Kojima was chosen as one of Newsweek magazine's ten most influential people in its special "Who's Next" cover story, and was granted the "Lifetime Achievement Award" at the "Game Developers Choice Awards" in 2009. His focus is constantly on the future, as he continues to push the boundaries of the gaming medium with his philosophy of game designs that "make the impossible possible".